PACIFIC OCEAN (July 23, 2007) - Guided-missile destroyer USS O'Kane (DDG 77) conducts a replenishment at sea with Military Sealift Command fast combat support ship USNS Bridge (T-AOE 10). 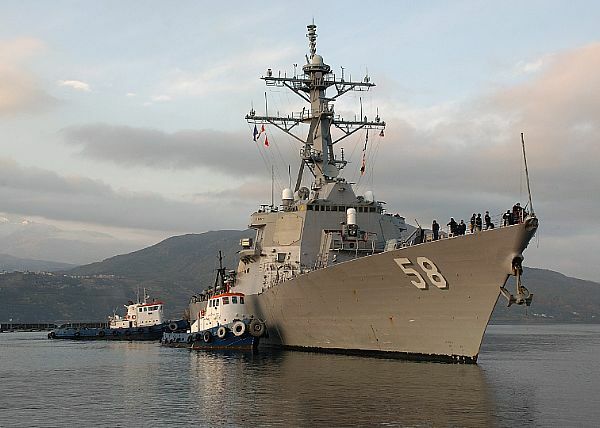 SOUDA BAY, Crete, Greece (July 25, 2007) - Arleigh Burke-class guided-missile destroyer Forrest Sherman (DDG 98) arrives in Greece for the first port visit of her maiden deployment. Forrest Sherman, commissioned Jan. 28, 2006, U.S. Navy photo by Mr. Paul Farley. USS Cole (DDG-67) moored in Portsmouth harbour on 2nd October 2007. USS Cole (DDG-67) alongside South Railway Jetty, Portsmouth Naval Base on the 3rd October 2007. SAN DIEGO (Oct. 8, 2007) - Guided-missile destroyer USS Milius (DDG 69) prepares to pull into her berth at Naval Base San Diego. 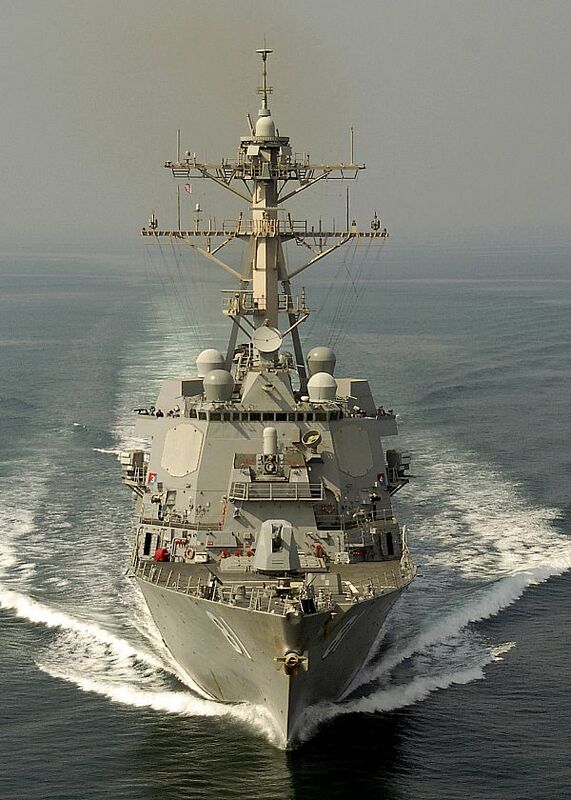 The ship completed a six-month deployment with the Bonhomme Richard Expeditionary Strike Group. While deployed, the ship supported maritime operations in the Persian Gulf including interdiction patrols and presence activities. Mais bon, maintenant ils vont avoir tout le temps ! BOSTON (Nov. 3, 2007) - Sailors man the rails aboard guided-missile destroyer USS Sampson (DDG 102) during the ship's commissioning ceremony. Sampson is the fourth ship named for Rear Adm. William T. Sampson, a naval hero during the Spanish-American War. The three previous ships, all destroyers named in honor of Sampson, were also commissioned in Boston. 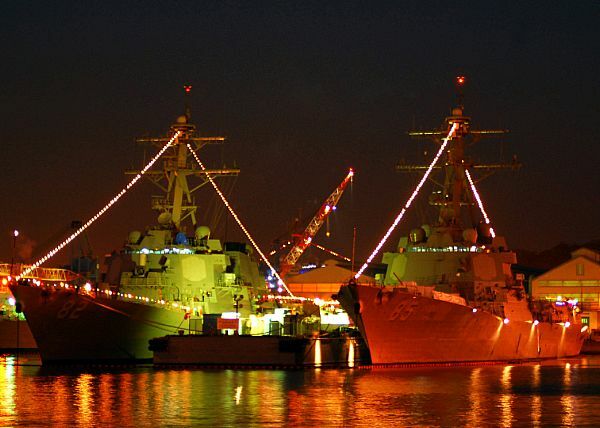 YOKOSUKA, Japan (Dec. 18, 2007) Holiday lights illuminate the Arleigh Burke-class guided-missile destroyers USS Lassen (DDG 82) and USS McCampbell (DDG 85) at Fleet Activities Yokosuka. Every Yokosuka-based ship of the forward-deployed naval forces is decorated with holiday lights to celebrate the festive season. Just before midnight on New Year's Eve, every ship will go black for a countdown to the New Year. At midnight, every ship will illuminate its holiday lights to bring in the New Year. SOUDA BAY, Greece (Jan. 9, 2008) The guided missile destroyer USS Laboon (DDG 58 ) arrives for a routine port visit to the island of Crete. Laboon is on a scheduled six-month deployment in support of Standing NATO Maritime Group (SNMG) 2 and is conducting operations in support of Operation Active Endeavor. Active Endeavor operates in the Mediterranean Sea and is designed to prevent the movement of terrorists or weapons of mass destruction as well as to enhance the security of shipping in general. USS Cole (DDG-67) in the port Valletta (Malta) on 09-02-2008. PERSIAN GULF (Feb. 11, 2008) The guided-missile destroyer USS Winston S. Churchill (DDG 81), assigned to the U.S. 5th Fleet, patrols the Persian Gulf. 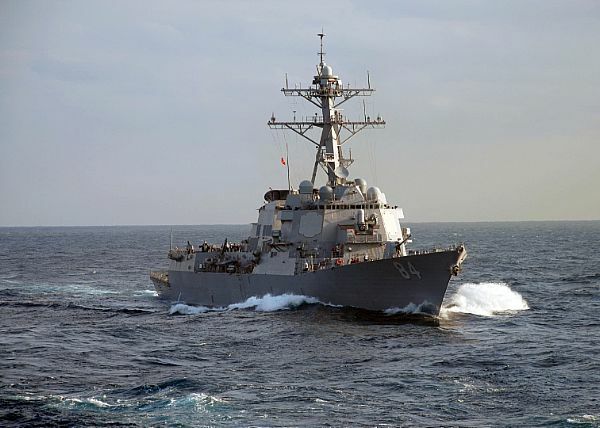 U.S. and coalition forces maintain a naval and air presence in the region to deter destabilizing activities and safeguard the region's vital links to the global economy. ATLANTIC OCEAN (Feb. 21, 2008) The guided-missile destroyer USS Bulkeley (DDG 84) crosses the Atlantic Ocean as part of the Nassau Expeditionary Strike Group. 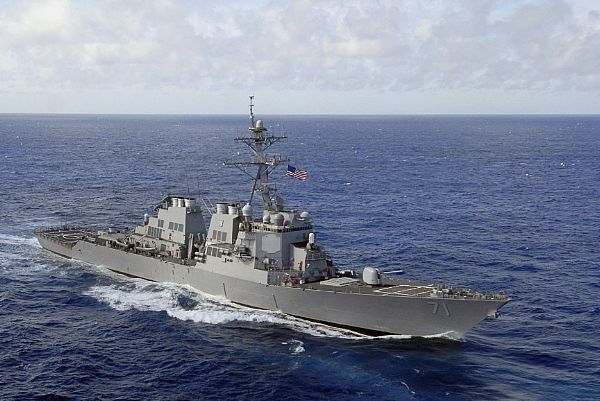 The strike group is deployed to the U.S. 6th Fleet area of responsibility conducting maritime security operations and theater security coordination efforts. ATLANTIC OCEAN (Feb. 21, 2008) The guided-missile destroyer USS Ross (DDG 71) crosses the Atlantic Ocean as part of the Nassau Expeditionary Strike Group. 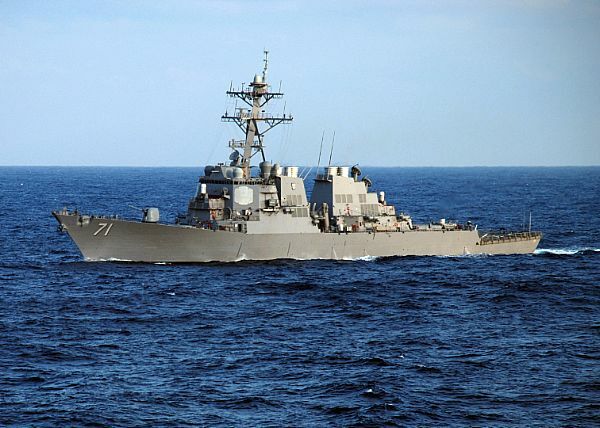 The strike group is deployed to the U.S. 6th Fleet area of responsibility conducting maritime security operations and theater security coordination efforts. ATLANTIC OCEAN (Feb. 25, 2008) The guided-missile destroyer USS Ross (DDG 71) crosses the Atlantic Ocean during a scheduled deployment as part of the Nassau Expeditionary Strike Group supporting maritime security operations and theater security cooperation efforts in the U.S. 5th and 6th Fleet areas of responsibility.